Hey guys! Just a quick little post, I had about 10 minutes for photos this morning so it was a little rushed but I wanted to share an outfit with you while it wasn't totally freezing out! This outfit isn't anything crazy exciting but it is definitely my staple, go-to winter look! Leggings, body-con dress, over sized sweater, thick knee-high socks and boots and a scarf! I seem to always go to a black and white scheme in the winter so I try and make sure I have some pop of color somewhere! Accessories are always the easy way too add in some color...bags, scarfs, hats and gloves! Lets face it winter months can be dark and dreary so you may as well add a beam of color and light where you can! Hope you like it! Enjoy! Amazing style! 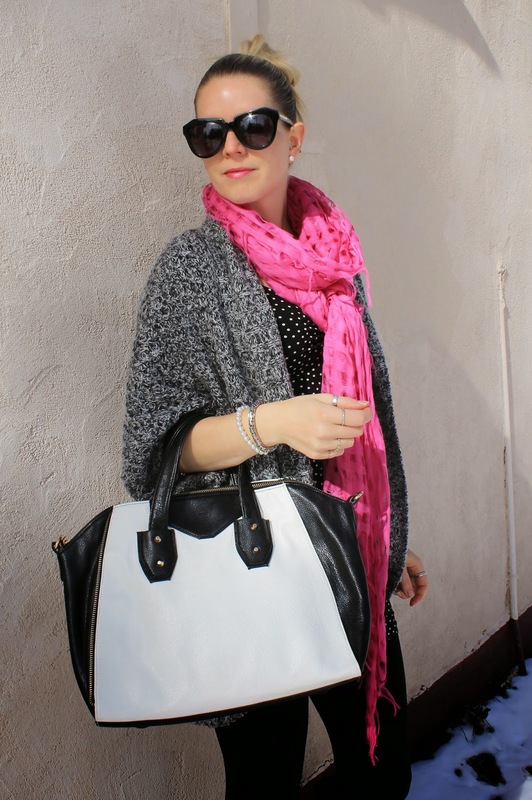 Am loving the polka dots and hot pink scarf combo! Perfect go to winter look! So jealous the storm brought you snow. All we got were cold winds. LOVE your gray sweater! Looks so comfy <3 I'm also incredibly jealous of the snow where you live! Cute scarf! I like the bright colour! In love with that cardigan!